Georgetown is a historic neighborhood, commercial, and entertainment district located in northwest Washington, D.C., situated along the Potomac River. Much of Georgetown is surrounded by parkland and green space that serve as buffers from development in adjacent neighborhoods, and provide recreation: Rock Creek Park, the Oak Hill Cemetery. The primary commercial corridors of Georgetown are M Street and Wisconsin Avenue, whose high fashion stores draw large numbers of tourists as well as local shoppers year-round. There is also the Washington Harbour complex on K Street, on the waterfront, featuring outdoor bars and restaurants popular for viewing boat races. Between M and K Streets runs the historicChesapeake and Ohio Canal, today plied only by tour boats; adjacent trails are popular with joggers or strollers. The primary commercial corridors of Georgetown are the intersection of Wisconsin Avenue & M Street, which contain high-end shops, bars, restaurants, and the Georgetown Park enclosed shopping mall, as well as the Washington Harbour waterfront restaurants at K Street, NW, between 30th and 31st Streets. Georgetown is home to the main campus of Georgetown University and numerous other landmarks, such as the Volta Bureau and the Old Stone House, the oldest unchanged building in Washington. The embassies of France, Mongolia, Sweden, Thailand, andUkraine are located in Georgetown. Founded in 1751 in the state of Maryland, the port of Georgetown predated the establishment of the federal district and the City of Washington by 40 years. Georgetown remained a separate municipality until 1871, when theUnited States Congress created a new consolidated government for the whole District of Columbia. 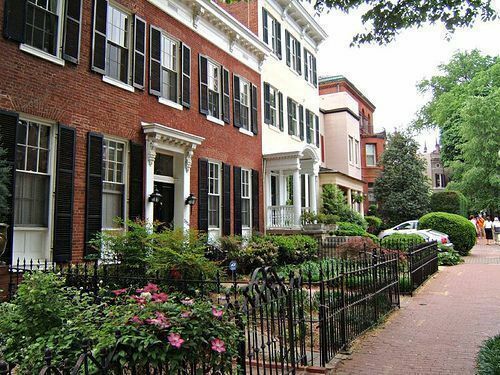 A separate act passed in 1895 specifically repealed Georgetown’s remaining local ordinances and renamed Georgetown’s streets to conform with those in the City of Washington. Georgetown is bounded by the Potomac River on the south, Rock Creek to the east, Burleith and Glover Park to the north, with Georgetown University on the west end of the neighborhood. Montrose Park and Dumbarton Oaks are located along the north and east edge of Georgetown, east of Wisconsin Avenue. The neighborhood is situated on bluffs overlooking the Potomac River. As a result, there are some rather steep grades on streets running north-south. There is no Metro station in Georgetown. Three stations are located roughly one mile (1.6 km) from the center of Georgetown: Rosslyn (across the Key Bridge in Arlington), Foggy Bottom-GWU, and Dupont Circle. WMATA Metrobuses: 30-series, D-Series, and G2. The Old Stone House, built 1765, is one of the oldest buildings in Washington, D.C.. Situated on the fall line, Georgetown was the farthest point upstream that oceangoing boats could navigate the Potomac River. In 1632, English fur trader Henry Fleet documented a Native American village of the Nacotchtank people called Tohoga on the site of present-day Georgetown and established trade there.The area was then part of the Province of Maryland, a British colony. George Gordon constructed a tobacco inspection house along the Potomac in approximately 1745. The site was already a tobacco trading post when the inspection house was built. Warehouses, wharves, and other buildings were then constructed around the inspection house, and it quickly became a small community. It did not take long before Georgetown grew into a thriving port, facilitating trade and shipments goods from colonial Maryland. In 1751, the legislature of the Province of Maryland authorized the purchase of 60 acres (240,000 m2) of land from Gordon and George Beall at the price of £280. A survey of the town was completed in February 1752. Since Georgetown was founded during the reign of George II of Great Britain, some speculate that the town was named after him. Another theory is that the town was named after its founders, George Gordon and George Beall. The Maryland Legislature formally issued a charter and incorporated the town in 1789. (Although Georgetown was never officially made a city, it was later referred to as the “City of Georgetown” in several 19th-century acts of Congress.) Robert Peter, an early area merchant in the tobacco trade, became Georgetown’s first mayor in 1790. Col. John Beatty established the first church in Georgetown, a Lutheran church on High Street. Stephen Bloomer Balch established a Presbyterian Church in 1784. In 1795, the Trinity Catholic Church was built, along with a parish school-house. St. John’s Episcopal Church was built in 1803. Banks in Georgetown included the Farmers and Mechanics Bank, which was established in 1814. Other banks included the Bank of Washington, Patriotic Bank, Bank of the Metropolis, and the Union and Central Banks of Georgetown. Newspapers in Georgetown included the Republican Weekly Ledger, which was the first paper, started in 1790. The Sentinel was first published in 1796 by Green, English & Co. Charles C. Fulton began publishing the Potomac Advocate, which was started by Thomas Turner. Other newspapers in Georgetown included the Georgetown Courier and the Federal Republican. William B. Magruder, the first postmaster, was appointed on February 16, 1790, and in 1795, a custom house was established on Water Street. General James M. Lingan served as the first collector of the port. In the 1790s, City Tavern, the Union Tavern, and the Columbian Inn opened and were popular throughout the 19th century. Of these taverns, only the City Tavern remains today, as a private social club (the City Tavern Club) located near the corner of Wisconsin Avenue and M Street. George Washington frequented Georgetown, including Suter’s Tavern where he worked out many land deals from there to acquire land for the new Federal City. A key figure in the land deals was a local merchant named Benjamin Stoddert, who arrived in Georgetown in 1783. He had previously served as Secretary to the Board of War under the Articles of Confederation. Stoddert partnered with General Uriah Forrest to become an original proprietor of the Potomac Company. Stoddert and other Potomac landowners agreed to a land transfer deal to the federal government at a dinner at Forrest’s home in Georgetown on March 28, 1791. Stoddert bought land within the boundaries of the federal district, some of it at the request of Washington for the government, and some on speculation. He also purchased stock in the federal government under Hamilton’s assumption-of-debt plan. The speculative purchases were not, however, profitable and caused Stoddert much difficulty before his appointment as Secretary of the Navy to John Adams. Stoddert was rescued from his debts with the help of William Marbury, later of Marbury v. Madison fame, and also a Georgetown resident. He ultimately owned Halcyon House at the corner of 34th and Prospect Streets. The Forrest-Marbury House on M Street is currently the embassy of Ukraine. After the establishment of the federal capital, Georgetown became an independent municipal government within the District of Columbia, along with the City of Washington, the City of Alexandria, and the newly created County of Washington and County of Alexandria (now Arlington County, Virginia). Georgetown around 1862. Overview of the C&O Canal,Aqueduct Bridge at right, and unfinished Capitol dome in the distant background. By the 1820s, the Potomac River had become silted up and was not navigable up to Georgetown. Construction of the Chesapeake & Ohio Canal began in July 1828, to link Georgetown toHarper’s Ferry, Virginia (now West Virginia). But the canal was soon in a race with the Baltimore & Ohio Railroad and got to Cumberland eight years after the railroad, a faster mode of transport, and at the cost of 77,041,586. It was never profitable. From its beginning to December 1876, the canal earned $35,659,055 in revenue, while expending $35,746,301. The Canal nonetheless provided an economic boost for Georgetown. In the 1820s and 1830s, Georgetown was an important shipping center. Tobacco and other goods were transferred between the canal and shipping on the Potomac River. As well, salt was imported from Europe, and sugar and molasses were imported from the West Indies. These shipping industries were later superseded by coal and flour industries, which flourished with the C & O Canal providing cheap power for mills and other industry. In 1862, the Washington and Georgetown Railroad Company began a horsecar line running along M Street in Georgetown and Pennsylvania Avenue in Washington, easing travel between the two cities. Sailing vessels docked at the Georgetown waterfront, ca. 1865. The municipal governments of Georgetown and the City of Washington were formally revoked by Congress effective June 1, 1871, at which point its governmental powers were vested within the District of Columbia. The streets in Georgetown were renamed in 1895 to conform to the street names in use in Washington. By the late 19th century, flour milling and other industries in Georgetown were declining, in part due to the fact that the canals and other waterways continually silted up. Nathaniel Michler and S.T. Abert led efforts to dredge the channels and remove rocks around the Georgetown harbor, though these were temporary solutions and Congress showed little interest in the issue. An 1890 flood and expansion of the railroads brought destitution to the C&O Canal, and Georgetown’s waterfront became more industrialized, with narrow alleys, warehouses, and apartment dwellings which lacked plumbing or electricity. Shipping trade vanished between the Civil War and World War I. As a result, many older homes were preserved relatively unchanged. P Street NW features conduit streetcar tracks installed in the 1890s, unused since 1960. In 1915, the Buffalo Bridge (on Q Street) opened and connected this part of Georgetown with the rest of the city east of Rock Creek Park. Soon thereafter, new construction of large apartment buildings began on the edge of Georgetown. In the early 1920s, John Ihlder led efforts to take advantage of new zoning laws to get restrictions enacted on construction in Georgetown. A 1933 study by Horace Peaslee and Allied Architects laid out ideas for how Georgetown could be preserved. The C & O Canal, then owned by the Baltimore & Ohio Railroad, formally ceased operations in March 1924. After severe flooding in 1936, B & O Railroad sold the canal to the National Park Service in October 1938. The waterfront area retained its industrial character in the first half of the 20th century. Georgetown was home to a lumber yard, a cement works, the Washington Flour mill, and a meat rendering plant, with incinerator smokestacks and a power generating plant for the old Capital Traction streetcar system, located at the foot of Wisconsin Avenue, which closed in 1935, and was demolished in October 1968. In 1949, the city constructed the Whitehurst Freeway, an elevated highway above K Street, to allow motorists entering the District over theKey Bridge to bypass Georgetown entirely on their way downtown. 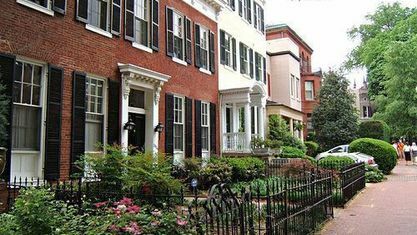 In 1950, Public Law 808 was passed, establishing the historic district of “Old Georgetown.”The law required that the United States Commission of Fine Arts be consulted on any alteration, demolition, or building construction within the historic district. Georgetown is home to many of the politicians and lobbyists. Georgetown’s landmark waterfront district was further revitalized in 2003 and includes hotels such as a Ritz-Carlton and a Four Seasons. Georgetown’s highly traveled commercial district is home to a variety of specialty retailers and fashionable boutiques.